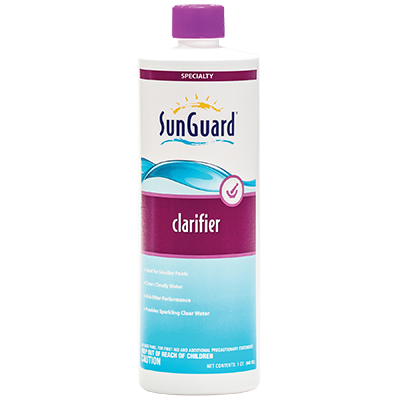 SunGuard Soft Sided Pool Chemcials are a selection of products from our SunGuard pool chemical line that are ideal for maintaining the water clarity of soft sided and small sized pools. 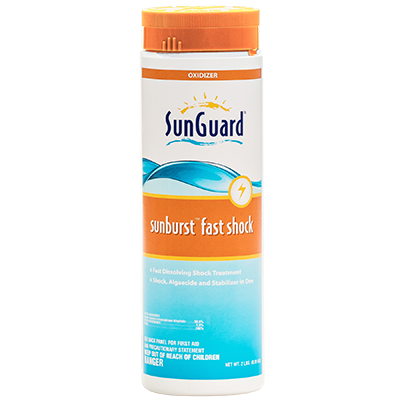 A built-in stabilizer helps prevent the sunlight from degrading the chlorine. 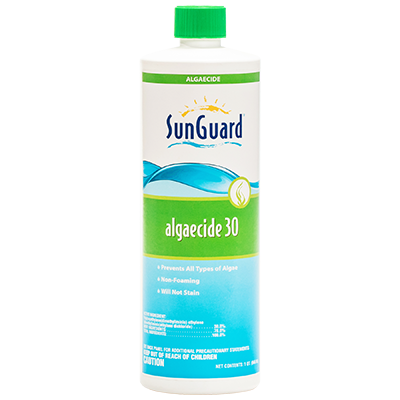 Kills bacteria, controls algae, and destroys organic contaminants from the water. Simplifies pool care with long lasting routine chlorination. Gentle on pool equipment and ideal for all pool surfaces. 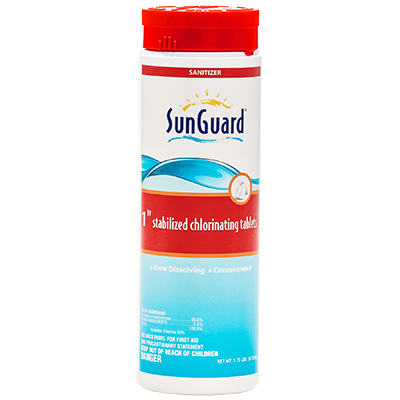 For best results use (16) SunGuard 1˝ Stabilized Chlorinating Tablets for daily chlorination, extra tablets may be added if needed to maintain free chlorine level of 1-3 ppm range. Always add tablets to a new floater or automatic feeder. Always read feeder instructions before use. Long lasting, slow dissolving tablet which provides routine chlorination for clean, clear pool water. Tablets release chlorine which continually kills bacteria, controls algae, and destroys organic contaminants from the water. Simplifies pool care with long lasting routine chlorination through feeder of floater application, gentle on pool equipment and ideal for all pool surfaces. 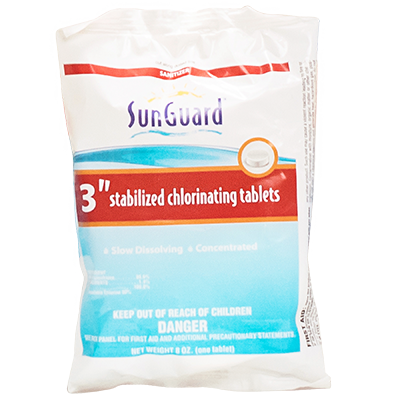 For best results use (1) SunGuard 3˝ Stabilized Chlorinating Tablet for daily chlorination, extra tablets may be added if needed to maintain free chlorine level of 1-3 ppm range. Always add tablets to a new floater or automatic feeder. Always read feeder instructions before use. Add 24 to 36 oz per 10,000 gallons of pool water for the initial dose. Maintenance dosage 6 oz. per 10,000 gallons should be made every 5-7 days. 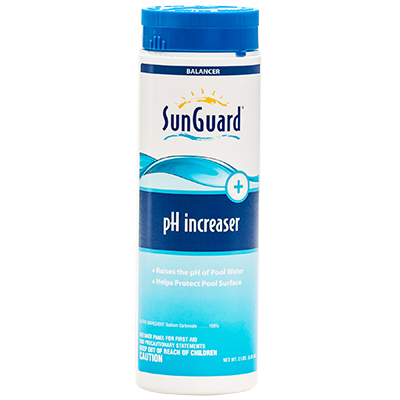 Raises the stabilizer (cyanuric acid) level of pool water. 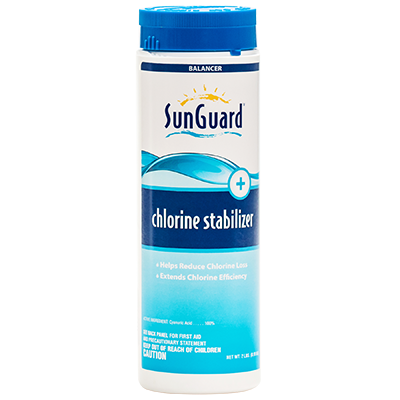 Proper stabilizer levels protect chlorine form the degrading effects of sunlight. Test stabilizer levels monthly and add this product if stabilizer level is below 30ppm. 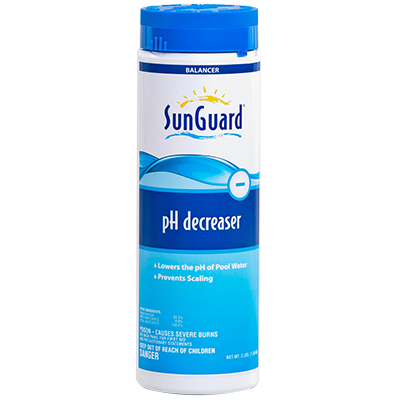 Raises the pH of pool water efficiently and economically. Raises the calcium hardness of pool water to aid in the prevention of corrosion, etched plaster and other problems resulting from low calcium hardness. 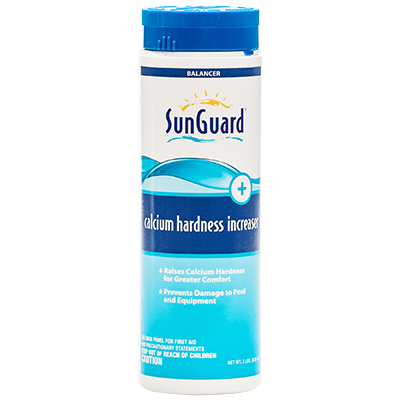 Test calcium hardness monthly and add this product if calcium hardness is below 200ppm . If water is above 500ppm, drain some water and replace with fresh water that has a lower calcium hardness. Test total alkalinity weekly and add this product if total alkalinity is below 100 ppm. 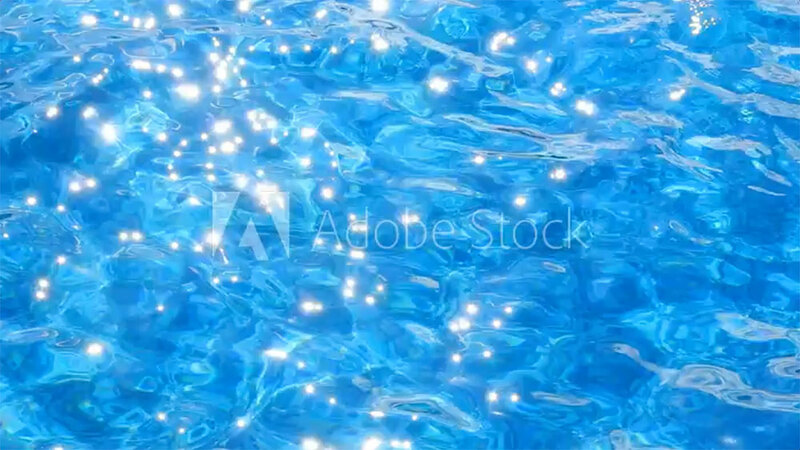 Restores the sparkle to dull looking water. Helps minimize consumption of more costly chemicals. Clarifies and decolorizes low turbidity water by clearing impurities suspended in pool water. Works immediately and during pool use. Eliminates the need to add other balancing chemicals. Does not upset pH of water.